Jessup® 3100 Commercial Grade Safety Track® non-skid tapes are the only anti-slip surfaces certified as ‘High Traction’ by the NFSI. When you need a non slip surface to protect your people, your customers and your reputation, which will you choose? It’s the silicone carbide grit that ensures Safety Track® commercial grade surfaces are not only anti-slip, but durable too. Indoors and out, Jessup® Commercial Grade Safety Track® is the most effective, durable non-slip surface on the market. Why Jessup® Commercial Grade Safety Track®? Slip hazards are a risk to any organisation’s wellbeing. Protect against lost time, sick payments, compensation and loss of reputation with Commercial Grade Safety Track®. 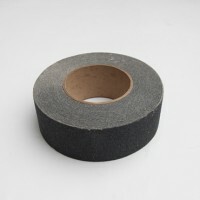 The surface of abrasive particles is bonded by a tough, durable polymer to a dimensionally stable plastic film. The reverse side is coated with a pressure sensitive adhesive, which enables the film to be anchored to a wide variety of surfaces. No non-skid material delivers greater slip resistance. Jessup® 3100 Commercial Grade Safety Track® is National Flooring Safety Institute (NFSI) certified for “High Traction”. Roll width 1/2" to 48"
*Pre-cut, reflective and photoluminescent ‘glow in the dark’ strips are also avaliable.